The last six months have been a flurry of activity in our basement. With over 22,000 artifacts, the basement can be a crowded place. However, thanks to a Museum Assistance Project grant from Heritage Canada and funding from the City of Port Moody, the Heritage Society has new compact shelving units in half of our storage. Bury Media did a great job installing the movable shelving last March. Then our Collection Assistant, Peter Wallace spent the last four months re-shelving all the artifacts. Now, our storage facilities are the envy of every museum with artifacts safely stored away. The new shelves have also given use more space to continue collecting into the future. Thanks to many great volunteers for helping to move so many large and heavy artifacts. Thanks also to Williams Moving and Storage for providing storage for our valuables for a few months. New office space for donations and research. All of us at the Port Moody Station Museum would like to wish you the very best this holiday season and a Happy New Year. 2011 has been an excellent year for our Museum. We had record breaking attendance this summer and at our Easter Egg Hunt and Ioco Ghost Town Days events. We have made an excellent start on our history book which we are looking forward to seeing in the new year. And we got a new roof! Thank you to all of our members, volunteers and staff who helped make these things happen. We couldn’t do what we do without your support. The Museum will be closed December 24, 25, 31 and January 1 in addition to our regular closure on Mondays and Tuesdays. Staff at the Museum are furiously writing this summer! Work on the Port Moody history book is progressing rapidly, with an expected completion in early 2012, but we need the help of any and all seniors with memories of life in Port Moody. The Museum has arranged two reminiscing meetings in the remaining summer months. These meetings are a venue for seniors to reminisce and share memories of their times in Port Moody, which will be used to guide the history book’s content. Recent meetings have covered topics such as Moody Centre, including the schools, churches and businesses throughout the years, as well as transportation and May Days and Golden Spike Days. The information shared at these meetings has provided invaluable assistance during the writing process. Do you have any photos on these topics? Bring them to the meeting, or donate a copy to the Museum! The Port Moody Station Museum needs enthusiastic and engaging young actors to volunteer at our 125th CPR Train Anniversary and Canada Day Celebrations! We are looking for thespians between 13 and 18 to take on roles as characters from 1886, when the first CPR passenger train arrived in Port Moody. Volunteers will circulate in small groups around the Museum grounds and at the Golden Spike Days Festival in Rocky Point Park on July 1st, 2nd, and 3rd from noon to 4pm. Period costumes and a heritage acting workshop will be provided free to volunteers by Angela Brown. Volunteers must attend one of two workshops, Monday, June 6th or 27th from 3:30-5:30 at the Port Moody Station Museum, where Angela will teach 1880s-specific character acting and techniques for roving performances. Lunch will be provided to all volunteers. To participate in this fun and educational experience or for more information, please contact Laurel or Rebecca at the Port Moody Station Museum: 604-939-1648 or info@portmoodymuseum.org. The Port Moody Heritage Society is very pleased to announce it received a Federal grant through Service Canada’s New Horizons for Seniors program. 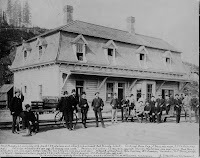 The grant will enable the Port Moody Station Museum to produce a history book of Port Moody. The project will involve a group of seniors researching and writing parts of the book and will require a committed amount of volunteer time. Other seniors can participate by sharing their Port Moody memories in reminiscing meetings to be held on specific themes of the book such as industries, neighbourhoods, social life, events and schools. The project is on a tight timeline with the book slated for completion in October 2011. The Museum welcomes anyone interested in helping with the book. The amount of time required can be adjusted to fit everyone’s needs and all are welcome. Please call Jim or Rebecca at the Museum at 604-939-1648. Ioco Ghost Town Day is a family oriented heritage event that will be held at the Ioco lawn bowling green on Sunday October 4th from noon-4pm. The focus of the event will be a variety show with a number of different musical, dance and other performing arts acts. There will also be booths from a variety of different community organizations. The Port Moody Heritage Society is in charge of the hot dog concession and providing crafts and games for kids. We are looking of a variety of volunteers to help out. As part of a fundraiser for the Port Moody Station Museum, the Museum will receive $50 for each volunteer that participates in this event. We need 5 volunteers for the concession stand, 8 volunteers for children games and crafts, 2 volunteers to help set up and take down tents, and 1 volunteer who can sit with the Ioco Heritage photo display. We also need 12 volunteers with a dramatic spirit to participate in our heritage fashion show. Participants will be provided costumes appropriate to Ioco heritage. Please let me know if you are interested in helping out. The Port Moody Station Museum is looking for some model train enthusiasts to give advice and speak to visitors about model trains for our events on July 1st, 4th and 5th. If you are or know of a model train enthusiast, please contact me at the number below. Having a model train is not required.